Officials were on the scene of a McDonald's in Miami Gardens Friday morning. Two men are in critical condition at Jackson Memorial Hospital's Ryder Trauma Center after a shooting at a Miami Gardens McDonald's Friday, police said. They identified the two men who were shot in a Mercedes-Benz as Michael Sexton, 23, and Martrell Brown, 26. Aerial footage showed police surrounding the Benz and a silver Chevy parked by the drive-thru window of the fast food restaurant at 18250 NW 27th Ave. Police responded to the shooting at 6:44 a.m. Witnesses said someone from inside the Chevy was the one shooting towards the Benz. Afterwards, someone was seen jumping out of the Chevy and running away, witnesses said. 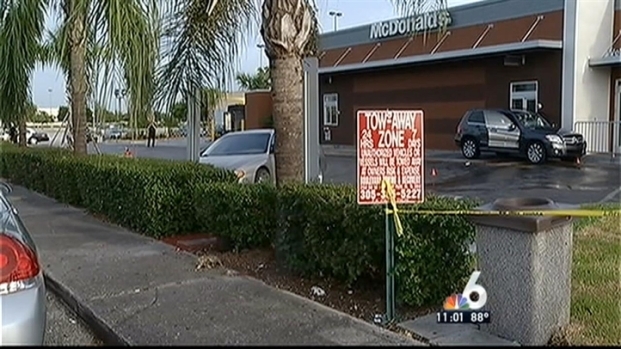 Police have not released an official motive for a Friday morning shooting at a Miami Garden's McDonald's. NBC 6's Bobby Brooks spoke with one of the victim's brothers Calvin Stewart about the incident. Blood and bullet casings could be seen on the ground next to the cars. Witness Peppermint Collins said a series of bangs could be heard from inside the McDonald's. "At first we didn't know what it was and the cashier was like, 'Everybody duck,'" she said. "It was a lot but the only thing going through our mind was to get out of there." Collins said police were unable to get a description of the gunman or gunmen. Brittany Sexton said her twin brother Michael is no saint, acknowledging he has a criminal history, but she added, "Nobody deserves this regardless of what you did in your life." One man said his brother was one of the victims, but had no idea what the motive could have been. "He probably was going to work or something, we don't know," Stewart Collins said. With no motive and no suspects in custody, Brittany Sexton pleaded with the public to come forward with information. As family and community members gathered to mourn the shooting death of 12-year-old Tequila Forshee, officers continued to search for the gunman or gunmen who may be responsible. 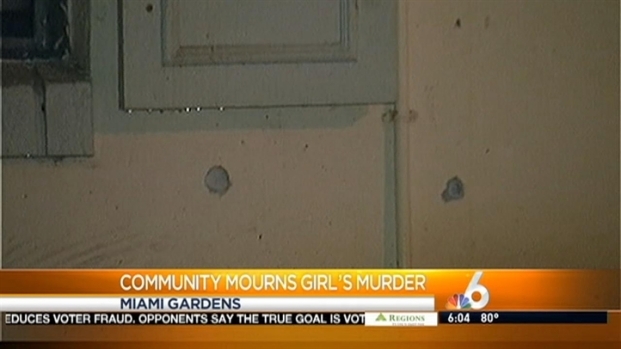 NBC 6's Bobby Brooks has the story. Officials have not released further details on the investigation.